Creating New Foods, also on the NZIFST website, is an introduction to food product development for product developers starting in the food industry and for undergraduate students starting in an introductory product development course. The book leads the reader through the PD project. This book, Food Product Development, is a textbook on the product development processes and the techniques used in food product development. It covers all stages of food product development from the initial concept of the new product, through to the final launching on the market and the analysis of the results. It is illustrated by examples of specific projects. It also provides the reader with the opportunity to study specific examples and to relate these to their own personal experiences. The stages in the PD process are discussed in detail. This provides the foundation for decision-making throughout the PD process - should a project continue, should it change direction, should it be abandoned? Techniques for the design of the food products, consumer studies, market analysis, and experimental techniques in process development, are also covered. This book is intended for a guide to product development for those working in the food industry including project teams, process engineers, and marketing personnel, as well as management. 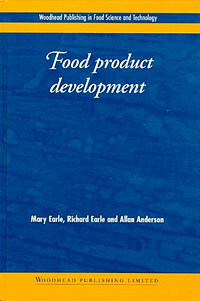 It can also be used as the textbook for student courses in food product development. © 2001 Woodhead Publishing Limited. Food Product Development, the Web Edition, 2017. Authors: M.D. Earle, R.L. Earle and A.M. Anderson. The hardback version is no longer in print. Copies of the paperback book can be purchased online from the Woodhead section of the Elsevier store, link above. Food Product Development. Copyright © 2001 Woodhead Publishing Limited.